This traditional Inn located off Hwy.70E on 4.5 acres among tall trees provides gracious hospitality and southern charm. 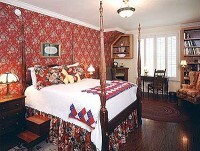 The main house and 3 cottages are furnished with antiques. Swings and rocking chairs on the porches beckon one to sit a spell and enjoy nature and the inn at its best. 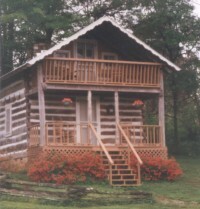 This cozy Log Cabin B&B, built in 1895 will sleep up to a family of 5. Located on the grounds of Falls Mill, an operating water-powered grain mill and museum. The kitchen is stocked with homemade pastries, fresh fruit, ham & eggs and freshly milled stone ground grits and multi-grain pancake mix. Near Center Hill Lake and among the bluffs, streams and waterfalls of the Highland Rim, Evins Mill offers the amenities of a resort in the setting of a country inn. A fetching location for weekend getaways, weddings and meetings, Evins Mill offers a mountain experience, only minutes from Nashville. An 11-room luxury B&B perched atop 15 secluded acres overlooking the Cumberland Plateau. "Simply Immaculate, Exceptional Service, and Breathtaking Views" are what our guests say! Fireplace or whirlpool rooms available. Up to 26 overnight guests for weddings and corporate, church & family retreats. Monteagle Inn Bed & Breakfast is the perfect location for business, family and wedding guests; or a great place to escape from the busy world. 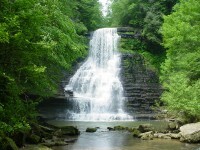 The Cumberland Plateau abounds with beautiful mountain scenery. Hiking, shopping, antiques and so much more!